Lethbridge, Alberta – Lethbridge Police have taken a dangerous weapon off the streets after responding to a suspicious activity complaint at a downtown apartment building. On April 12,2019 police responded to a report of suspicious activity at a unit along the 200 block of 2 Avenue South. Investigation determined the tenant, who was not present upon police arrival, had been allowing numerous people to come and go, stay over and sell drugs from the residence. A male subject along with a female were located inside the home and police observed drugs and ammunition in plain view. One of the squatters subsequently advised police of the presence of a firearm. 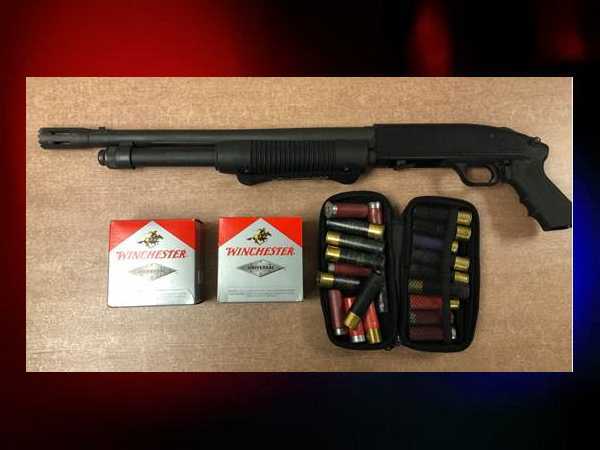 Police seized a 12-guage shotgun, nearly 100 rounds of ammunition, methamphetamine, carfentanil, 8 knives, a battle axe and a large quantity of stolen credit cards. The male was arrested on seven outstanding warrants and the female, who was not wanted, was directed to leave the premises. The investigation is ongoing to locate the tenant. Charges are pending.